The success of a business is largely due to the success of employee training. If your employees are poorly trained in their positions, time is wasted while people follow improper procedure, money is wasted in having to redo that work, and ultimately the company will lose profit. Luckily, creating a proper and successful training program for employees can be done rather easily with a little thought and precision. Have a clear goal in mind. Having a goal will only help you to focus on the future of your business as you create a successful training program. Consider an online employee training program. Online training is a popular and effective way to train employees as it takes little effort. Unless your training process change often (which is unusual for most companies), you’ll be able to use the same training program for years to come, which will save in-office man hours, as an employee won’t repeatedly have to convey this information to new employees. Use webinars to engage and motivate your employees, updating multiple people at once on new policies or procedures. Video conferencing is a great way to gather all employees at once for anything that you would like to inform them of or teach them about. It is an easy way to engage and converse with all of those going through the training process. Use eLearning to utilize interactive materials. You can create quizzes, diagrams, animations and other interactive materials to employees in training. This will assure that they are following the training program as they should. You can even monitor their interactions and retention. Social learning is a more informal approach that allows your employees to interact with each other. Usually online, the employees will have ways to talk and socialize with one another about all that they are learning. Sometimes this takes the form of messaging or online gathering communities. No matter how you go about creating an employee training program, make it successful by really putting thought into it first. Don’t hastily design a training program; it must be carefully and strategically created. This will only assure your business’ success. 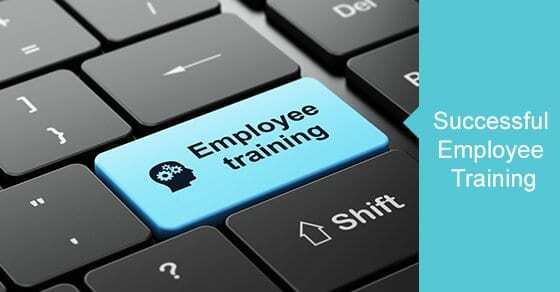 When you use different formats and ways of training including online interaction, hands-on demonstrations, quizzes, video conferences, and other helpful tools, you can create a training program almost guaranteed to properly train your employees. More often than not, a company’s failure is determined on how poorly the employees were trained and how little they knew about the company and their job position. Don’t set your company up for failure; properly and skillfully train your employees.